This bike rack mounts directly onto the tow ball. Has a load capacity of 50kg, suitable for carrying 2 bikes. Tilts with bikes loaded for easy access to rear hatch/boot. Bikes are gripped firmly and held clear of your vehicle to prevent damage to paintwork. Can be taken apart for easy storage. A specially designed Kitbag (15KB02) is available as an optional accessory. Easy to fit and use, no extra straps required to secure the bikes. Strong ratchet and patented bike cradles hold bikes securely. Built-in security cable locks bikes to the rack. The rack is locked to the tow bar adapter with the padlock supplied. MaxxRaxx 90cm Lighting Board + Bracket available, (item: 30LB01) to comply with legal requirements when rear lights and/or number plate are obscured or partially obscured. (Please note MaxxRaxx do not supply vehicle registration plates. These can be obtained from car accessory shops or tow bar/trailer centres. Please note you will require your V5 document along with proof of residence e.g Utility Bill). EasyFixx Voyager racks are suitable for all cars, vans and 4x4 vehicles without a rear mounted spare wheel. Designed for Swan Neck tow bars but can be fitted onto any 50mm tow ball.You cannot tow and carry at the same time with this model of cycle carrier. Click here if you have a 2-bolt flange tow bar and need to tow & carry bikes at the same time. 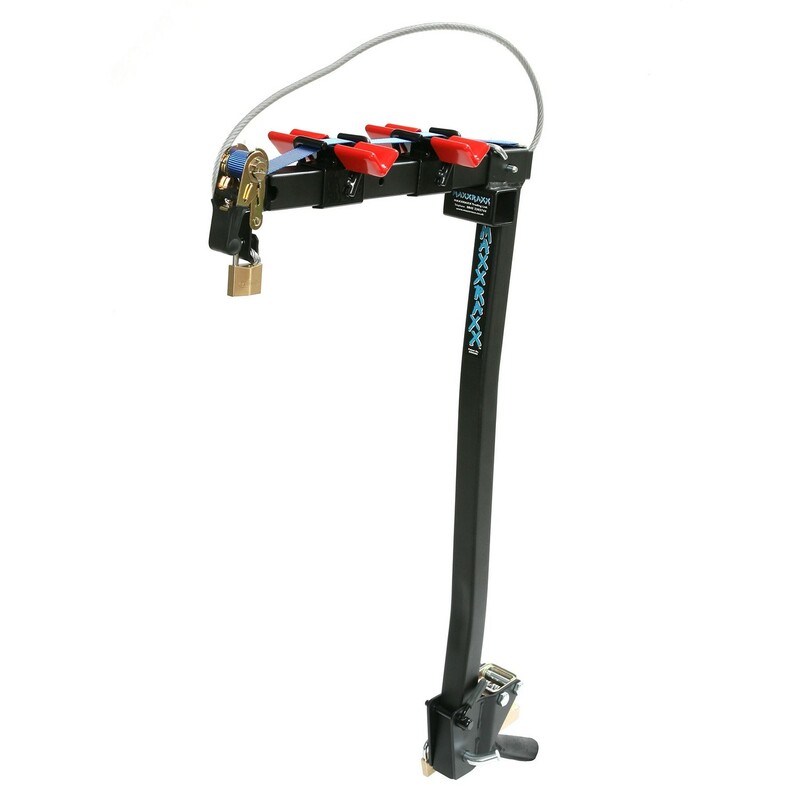 Click here if you have a Swan Neck tow bar and need to tow & carry bikes at the same time. Suitable only for vehicles with a nose weight rating of at least 50kg.